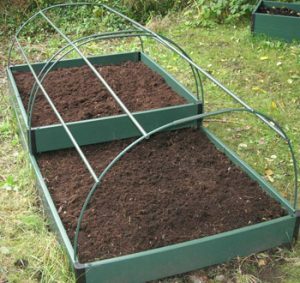 Canopy support – to be used with raised beds. Provides salad and vegetable growth year round when used with the addition of your own fleece or polythene. (Raised beds sold seperately) Suitable for raised beds of dimensions: 1 metre square, 1 metre x 2 metre, 1 metre x 3 metre, 1 metre x 4 metre, 1 metre x 5 metre or 127cm x 127cm (4ft x 4ft) and 127cm x 248cm (4ft x 8ft).